Creative Catering Banquet Hall is owned and operated by Huzsar Family LLC. They have been in the restaurant business for over 35 years and are 100% committed to serving the community. The Huzsar Family contacted Web Design Logics to redesign their current website so they can better serve and deliver information to their clients. The site had to be simple, clean, and edgy while remaining informative and easy to use for online customers. Once again Karyn Boyd was a pleasure to work with, she knew exactly what she wanted for the website and knew how to communicate to achieve her goals. 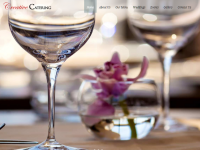 Creative Catering Banquet Hall was built using WordPress which will allow the website to grow with the business. We added a menu feature that will allow clients to browse through possible menu items for their event all hours of the day. The website was a complete success and customers are getting the information exactly as intended.